In a high-tech world, charity remains solidly low-tech. When donations are made in this month of giving, they often arrive in the form of a handwritten check, stuffed in an envelope, and sent via snail mail. But a handful of local tech companies and small start-ups are tapping into a burgeoning appetite on the Web for doing good. They run Internet auctions for causes, use Twitter and Facebook to spur giving, and find pro bono help for Massachusetts nonprofits and social enterprises. With the reach and ease of the Web, anyone in the world can potentially fund a playground project in Roxbury or instantly donate to the American Red Cross when a disaster hits. Online giving has risen sharply in recent years, hitting $22 billion in 2010, a 34 percent jump over 2009. It is already up 11 percent year over year for October, according to Blackbaud Inc., a South Carolina company that makes fund-raising software and tracks charitable giving. What’s more, Blackbaud found that online donors tend to be more generous. Their average gift is $62 rather than $32. Cauzoom is part of that shift. The Cambridge start-up founded by Michael Sattler this year gives community organizations a Web platform to raise money and offers individual donors a menu of projects, which range from helping Boston public schools purchase life jackets for a sailing club to stocking refrigerators in Maine for military families. The Web is enabling that kind of individualized giving and peer-to-peer donations, and allowing smaller organizations access to a pool of potential donors that once would have taken expensive advertising or direct mail campaigns to reach. Still, the vast majority of philanthropy happens off the Internet. Technology hasn’t found a replacement for lavish fund-raising dinners or building personal relationships with wealthy contributors. 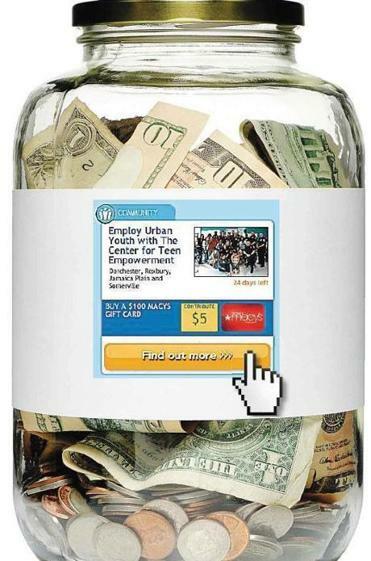 In 2010, online giving represented just 7 percent of the total $291 billion given to charities. Big nonprofit organizations - the household names like the United Way - raise their money through direct mail or traditional annual campaigns. And while the amount online donors are willing to give is increasing, few donors will give million-dollar gifts via the Web. Still, Jon Carson has helped charities raise $137 million since he started BiddingForGood Inc. in Cambridge in 2003. “My little piece of the solution is working a different bucket, which is household discretionary spending,’’ he said. He took an eBay approach to fostering philanthropy by bringing the charity auction online, giving groups - from schools to art museums - the ability to find wider audiences for their fund-raising auctions. But the sites looking to tap the do-gooder spirit that is happening online this time of year, when Web donations are at their highest, aren’t just looking for dollars. They also want time. “When the holiday season comes around, we always think what are we going to get. We want to reframe it around what we are going to give,’’ said Rachael Chong, chief executive of Catchafire, a Web start-up that matches social enterprises and nonprofits with professionals who want to volunteer specific skills for pro bono. It launched in Boston last month and so far has signed up about 40 professionals. MacLaughlin, of Blackbaud, suggests that the emergence of this new socially conscious Web ecosystem is having an impact on established nonprofit groups. They are certainly active on Facebook and Twitter and are the recipients of much of the online good will. But the nonprofit sector has been traditionally slow moving.